As an engineering focused company, Tigercat is continually innovating in an effort to increase efficiency and productivity in timber harvesting operations, silviculture and off road industrial applications. Find out more about Tigercat innovations and key technologies that have driven improvements in productivity, fuel efficiency and operator comfort. All Tigercat skidders are equipped with a revolutionary cab design. Turnaround, the two-position rotating seat, is standard equipment throughout the entire skidder product line. Tigercat’s Turnaround seat swivels effortlessly, locking in either the forward or rear-facing position. With Turnaround, forward and reverse have become meaningless terminologies. Tigercat’s Turnaround seat swivels effortlessly, locking in either the forward or rear-facing position. Once facing rear, the operator has full control of all machine functions including drive controls. Instead of a wheel, the steer function is controlled with an armrest-mounted joystick that places the operator in a more secure, less extended, ergonomically-correct seating position. Thanks to Tigercat’s advanced hydrostatic drive technology, the operator can drive comfortably with the full speed range available either blade-forward or grapple-forward. The operator has control of all machine functions in either seating position. Bumping over tough terrain, with your neck turned to the rear invites injury. With Turnaround, the spine is aligned correctly and impacts on the body are easier to absorb. Operators who use Turnaround routinely tell us that they feel better at the end of the day. Rather than perform a wide U-turn or 3-point turn, the operator simply shuttles back and forth from the deck to the cut block without ever turning the machine around. An asset in wet terrain shovel logging applications where the machine is confined to a mat or thinning applications where the skidder must travel down a narrow corridor. Both of these skidding duties require long trips in reverse. 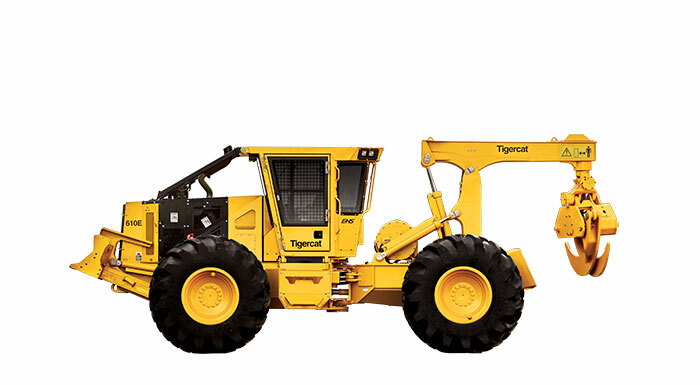 Used to its full potential, Turnaround expands the capabilities of the skidder. Imagine what Turnaround can do for you. The Larson family has been working in the forests of British Columbia since at least 1929, when Ivar and Lance’s grandfather started his first logging business.